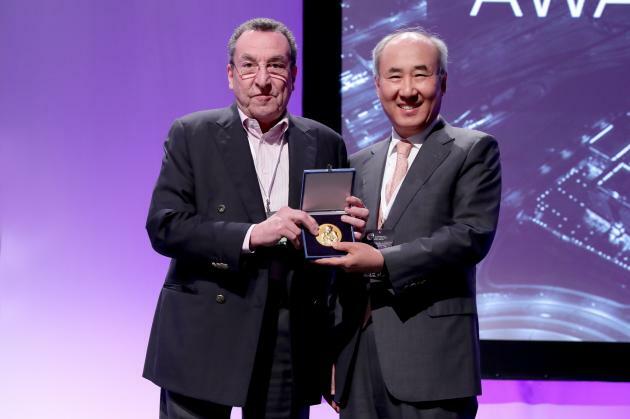 Professor Kim Dong-gyu (right) and Dan Leksell, founder of the Leksell Gamma Knife Society, hold the Pioneers in Radiosurgery award, during the 19th Leksell Gamma Knife Society Meeting. Professor Kim Dong-gyu of the neurology department at Seoul National University Hospital (SNUH) has recently become the first Korean to receive the “Pioneers in Radiosurgery” award, the hospital said Friday. The Leksell Gamma Knife Society in Dubai gives the Pioneers in Radiosurgery award every two years to doctors with outstanding achievements in radiation surgery. Professor Kim also received recognition for leading the development of regional radiotherapy field including his efforts in holding the ninth and 13th Leksell Gamma Knife Society Meeting, as well as the first Asian Leksell Gamma Knife Society, in Seoul. He has also published 65 papers on gamma knife and radiation surgery, and four reputable academic journals, including the "Current and Future Management of Brain Metastases." The meeting also highly assessed his works on the Youmans' Neurosurgery, the world's top neurosurgical textbook.